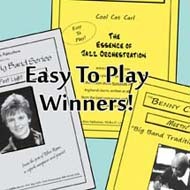 Festival 3-Chart Program - "Easy To Play Winners"
These 3 charts are excellent for any beginning band. Brass ranges are quite modest and rhythm parts are almost entirely written out. Your audiences will thoroughly enjoy these 3 magnificent charts!